In 2017, music has become more fragmented than ever, and this is true especially in Japan. The arrival of streaming services — not to mention increased attention given to YouTube as a platform — has given listeners more options in a country where CDs and vinyl are still copious. 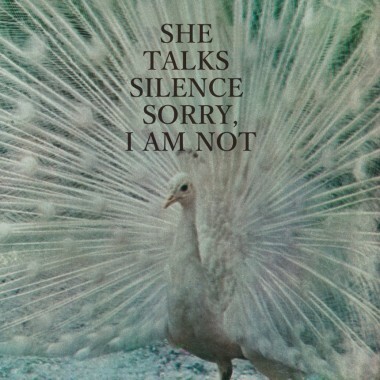 Yamaguchi’s latest as She Talks Silence, Sorry, I Am Not, arrived in July available on two — and only two — different extremes of how music can be consumed. 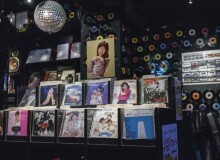 It can be acquired digitally, including on services such as Apple Music, or it can be purchased as a cassette tape (Yamaguchi’s favorite way of hearing tunes). She Talks Silence’s latest is one of the finest albums to emerge from Tokyo in 2017, a personal set of songs featuring muffled singing and jittery guitar playing that gives off the feeling that something is just askew. The rollout illustrates how music consumption has changed — instantly available and vaporous vs. physical and rare — but Yamaguchi shows emotionally resonant rock can still come through in the digital age. The project started in 2010, after Yamaguchi moved to the capital from Kagoshima (the Kyushu city experiences a 5.2 earthquake while we talk, resulting in a moment of phone checking from her and everyone else in the room). She Talks Silence stood out thanks to a feeling of closeness found on her recordings — 2010’s debut Noise & Novels sounded like something recorded through a wall, Yamaguchi singing in a near whisper that draws one in closer. Coupled with sticky hooks and slogan-ready lyrics — a line like “music is not a fashion” is the sort of sentence that makes you pledge yourself to a group — it was a highlight. Though her writing process remained the same, She Talks Silence’s form changed before Sorry, I Am Not. Following the first album, the project became a proper group, with Yamaguchi being joined by drummer Ami Kawai for live shows and subsequent albums. Although still relatively underground, She Talks Silence have moved up in recent years. “But after our second album, I realized that She Talks Silence is more of a personal project. Since it started as a solo project, the other members of the group understood it, they understood that was what I wanted to do.” That extends to her live show, which now features just her and a drum machine. Yamaguchi says Sorry, I Am Not is a deeply personal album, with the title referring to her “complex,” and large chunks of it inspired by the latest release from the ever-personally-probing American group, Xiu Xiu. Yet for all of its introspection and uneasy details (a stray crash of percussion, for example, or the slowly unfolding hypnotizer, “More Anti-Yourself”), it’s a constantly catchy album too, from the zippy drive of the titular number to the garage-rock sway of “Walk Away.” For all of its dark underpinnings, Sorry, I Am Not works just as well as something to get stuck in your head. The rest of the year will see She Talks Silence play shows around Tokyo and Osaka, along with a trek to Taiwan. Yamaguchi says she’s already thinking of her next album too — she’s bought an acoustic guitar, and is hoping to make something that is a bit more stripped down. That would be a change-up, but she’s just going down her own path.